We are happy to announce that the winners of the Adult BJJ divisions will win an OTM Gold Weave Gi. This gi is of super quality and cut and has been on the market for several years. It is made by the same company that makes Lucki Gis and is known for their durability and quality. This great gi will be for the 1st place winners in each weight class of the Novice, Intermediate, Advanced and Elite Divisions… 24 in total! 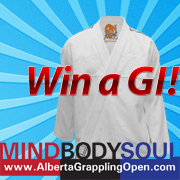 Another Great reason to compete at the Mind Body Soul / Alberta Grappling Open.